Two years ago in the United States, one out of every 10 babies was born prematurely, or before 37 weeks of pregnancy. Since that most recent statistic, there has been a significant push to try to reduce the rates of prematurity in the U.S., but the CDC notes that so far, it's too early to tell if our efforts have been working—or if the rates of prematurity will only continue to rise. Infants who are born prematurely are at higher risk for facing serious health consequences and conditions after birth. The more premature the baby is, the higher the chances they may experience complications. If a baby who is born prematurely needs extra medical care and attention, he or she will most likely be admitted to a neonatal intensive care unit or NICU. Stays in the NICU will vary depending on the baby's condition and health needs, but one thing is for certain: Babies in the NICU need all the help and medical care they can get. And unfortunately, new data has revealed that not all babies in the NICU receive the same amount of care and attention from medical staff. The reason? Race. 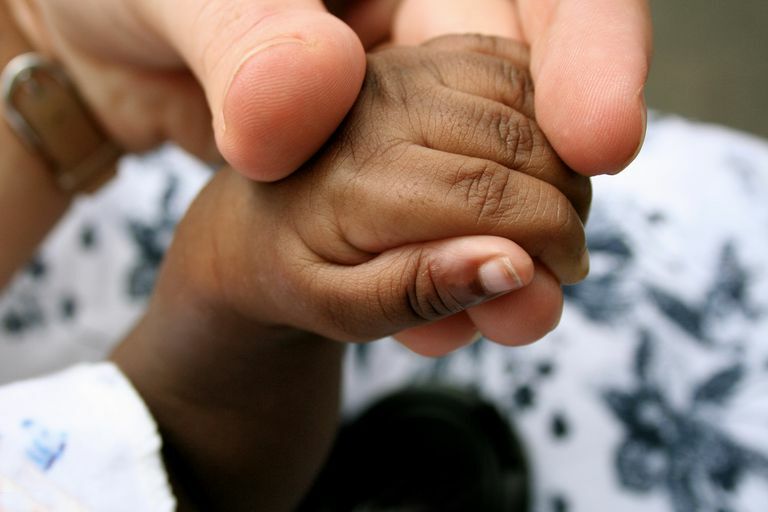 A new report by the American Academy of Pediatrics has revealed that there is a lot of racial disparity in care within the NICU. What does that mean? It means that babies who are white receive more attention and medical care from staff and experts, while babies who are not white receive less medical care. This fact is especially sobering when you consider the fact that the preterm birth rate is almost half as high in black women than in white women. That means that there is a higher percentage of black babies who are being born prematurely and will need more care to get started in life. But not only are more black babies being born prematurely, they are also then going on to receive less adequate medical care in the NICU. That's a double blow to their health and future. A study, published in the August 2017 issue of Pediatrics, looked at 18,616 very low birthweight infants (classified as babies weighing less than 1,500 grams at birth). One of the factors that determines how much care a preterm baby needs at birth is how much he/she weighs, so the study zeroed in on babies that are very low birthweight because they most likely need the most care. To put it into perspective,1,500 grams is just over 3 pounds, and the average full-term newborn weighs just over 7 pounds. Point being? These were tiny babies studied. The study analyzed the care of these infants, who were treated in 134 NICUs throughout California between 2010 and 2014, over a period of four years. The researchers used a special scale with 9 quality indicators called Baby-MONITOR used to rank the kind of care the babies receive in the NICU. They found that non-Hispanic white infants scored higher on measures of the process with the scale as compared to black and Hispanic babies. Black babies scored higher on measures of the outcome when compared to white babies and Hispanics scored the lowest on 7 of the 9 scale subcomponents. Specifically, the researchers found that more Hispanic and black infants were born at much lower gestational ages than white infants and that more black babies were born with lower Apgar scores. Hispanic infants were the most likely of any infant groups to require transfer to a higher level NICU facility after birth. When compared to white infants, both black and Hispanic infants were less likely to receive certain medical interventions, such as steroid therapy, eye exams, and even breast milk nutrition. Both groups of babies who were not white were also more likely to get an infection from the hospital. There were, however, two health outcomes that black infants had higher scores on: They were less likely to get a collapsed lung, and they had better growth rates, too. The findings also revealed that the differences in care were not universal; in some hospitals with lower-quality care, black babies actually fared better than white babies. They weren't entirely sure why some hospitals revealed different scores, but overall, Hispanic babies, followed by black babies seemed to fare worse than white babies in NICUs. Researchers found that overall, there were more babies who were Hispanic and black who were treated in lower-quality NICUs, which may explain some of the disparity. But even in higher-quality NICUs, the disparity still existed. Overall, the report explained that racial disparity in hospital care overall has existed for a long time and it's been a goal of medical experts to reduce that disparity. Even in the NICU setting, there are two major issues that can happen: 1) Black and Hispanic babies do not receive as high-quality care in the hospital and 2) Black and Hispanic babies are more likely to stay in a low-quality NICU, which means less access to medical resources and high-quality professionals and staff. Although doctors and medical experts aren't entirely sure how to fix the issue just yet, recognizing that a problem exists in the first place is an important beginning step. The study concluded that not only is there a difference in medical care based on a baby's racial and/or ethnic characteristics, but the disparity is a big one. "Significant racial and/or ethnic variation in quality of care exists between and within NICUs," the authors wrote in the study. The factors that go into racial disparity are deep and intertwined and not necessarily "just skin-deep," which makes them even harder to fix. For example, black babies may be more likely to be born in economically disadvantaged locations, which means they might be treated at a hospital with lower funding or lower-paid staff or their parents may face greater health challenges, such as substance abuse or other disorders that prevent proper prenatal care. The issue isn't just as simple as recognizing that there is a racial disparity in medical care but breaking down all of the factors that go into that disparity to try to resolve it. As hard as it may be to face the results from this study, it does provide an insightful look at how racial inequality can affect medical care, even in the NICU level. Even the youngest and most vulnerable of patients, premature infants, receive less medical care if their skin happens to be black than white premature babies. As a parent or caregiver, it's important to be aware of this sobering statistic so that we might be able to act as our child's medical advocate even more effectively. There is power in knowledge, even if it's a truth we wish we never had to recognize in the first place. It's important to be your baby's health advocate and be aware of some of the challenges that are in place within the medical system that could pose a risk to your baby's health, including racial disparities in care. Does Your Baby Qualify for Supplemental Security Income (SSI)? Should Our Preemie Receive Early Intervention Services?